This past September, I turned the big 3-6. For weeks, The Hubs asked me what I wanted for my birthday. I, honestly, just could not think of anything. For real. My special day came and went and still my mind was blank. "I want a home library...a place for all our children's books," I casually tossed out to The Hubs one day. 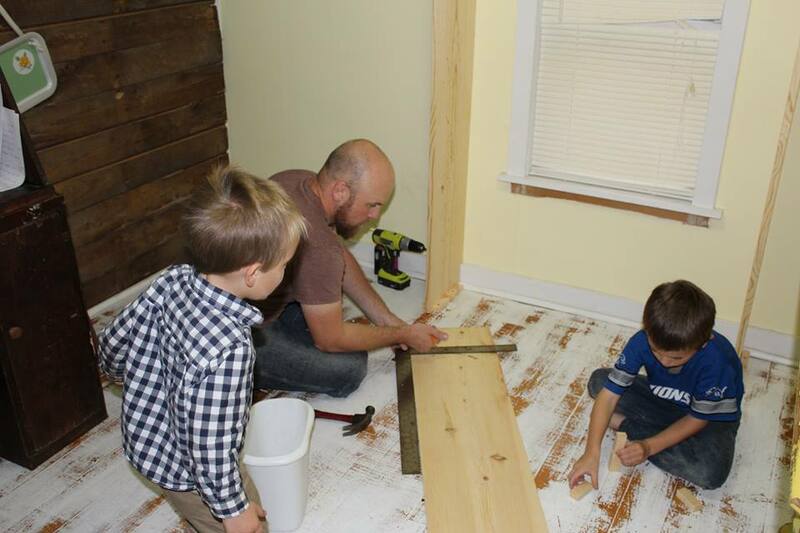 The next day, he rounded up some helpers and a stash of supplies, and got to work converting a small little attic room that had previously been used for crafting, sewing, and storage. A couple weeks later, my gift was complete. A home children's library of my very own. The Hubs christened the new space by presenting me with a plaque that he had made himself from a page from an old book. It reads, "May your shelves always overflow with books." Then came the unpacking. We live in a really tiny house and have never really had much space to display bookshelves. Prior to this lovely space, most of our books had been boxed up in plastic storage tubs in our basement. Every couple of days, I'd have to trek down to the "dungeon" with a flashlight and dig out one or two titles. But, those days are long gone. It was amazing to see all of our books laid out for the first time. It was like a happy reunion with long-lost friends. Having a children's library of my very own isn't just a way to feed my book buying addiction (although it is that). It is a place where my children can spread their arms wide and enjoy ALL of the books on the shelf. Each book is a built in YES and a stepping stone to help them grow a love for reading and a discerning eye. By creating a pallet filled with beauty and truth and virtue, I hope to help my children become repulsed by the tawdry and cheap offerings of the world. Come take a peek into my library. 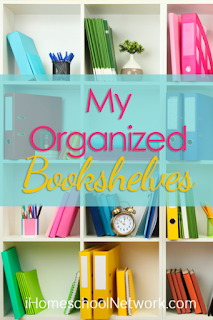 See how I've organized our books and listen as I share the system I've designed to encourage my kids to return borrowed books to their rightful place. While it probably wasn't necessary to build an entire room dedicated to children's books (a few shelves in the living room would have sufficed), I feel like this one act affirms the family culture we have spent years building. A reading culture...well, really ANY family culture...is a demonstration of what is important to you. It is a presentation of your priorities. It's not what you say that really matters in life. It's what you do. "Culture" is created in everyday choices. When given the choice of the "perfect" birthday gift, I chose books! For more ideas on organizing your home library, be sure to visit iHomeschool Network. I love this post and will use your paint stick idea! But I really must know, what are your favorite historical fiction series? I noticed Landmark and American Girl, but couldn't place the others. Love this! I organize my nonfiction books in our schoolroom a similar way and our fiction books are in the "Book Nook" at the top of our stairs - organized by series or type. I LOVE the paint stick idea and am going to make some for our family - which also happens to be color-coded. ;) I love books and hope to instill a love for them in our children. Hope it works for you like it's been working for us! How fantastic. I love it. We are blessed with a living room and a family room. Our living room is our family library and we call it such. I love having a safe place for them to find books. We've never really had bookshelves throughout the rest of the house because the rooms are so small. I'm really enjoying having a spot for all our books now. Awessssssome. Paint-stirrer markers even more awesome. Good job to you and husband! What a wonderful idea! I struggle with letting my kids loose at our local library as well so this would be a great solution. And your solution for helping the kids keep the books organized is genius! Thanks for making a video and sharing your children's library with us. Love this! Our last two houses haven't had room for our bookshelves, so most of my books have been in storage for a few years too. Now that we're building a house I'm hoping we're planning on a few built-ins like your shelves so we can get them all out again. Can't wait! We were also just at the thrift store yesterday and found 4 books of a great series called "Young Folks Library" from 1958 that has a GREAT selection of stories and excerpts from books. 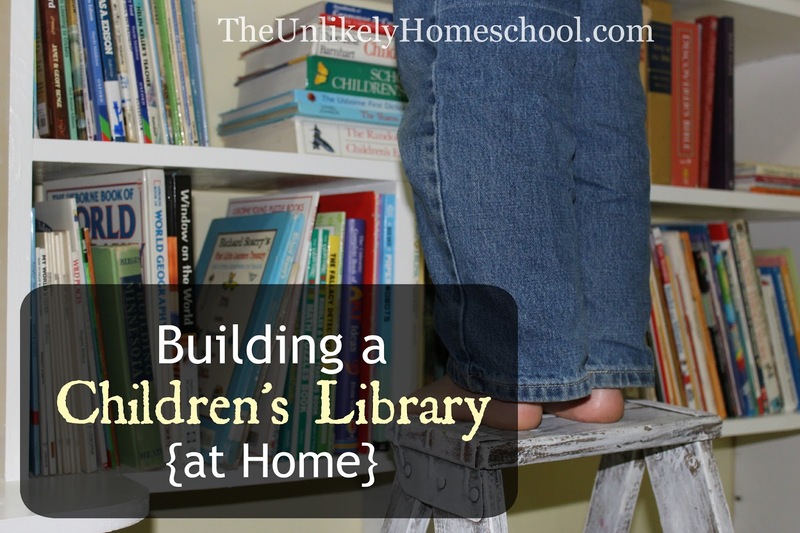 Really looking forward to building up our homeschool library too!